Recently, the tech firm, Nimbus has just introduced the world’s highest capacity SSD solid state disk with huge storage space. This SSD belongs to Nimbus’ Ultra High Capacity (UHC) product family, a range of memory units featuring a large storage space on a 3.5-inch case. A month ago we gathered that the South Korean giant Samsung was already mass producing a 30TB SSD after that 60TB SSD announced by Seagate had not materialized. 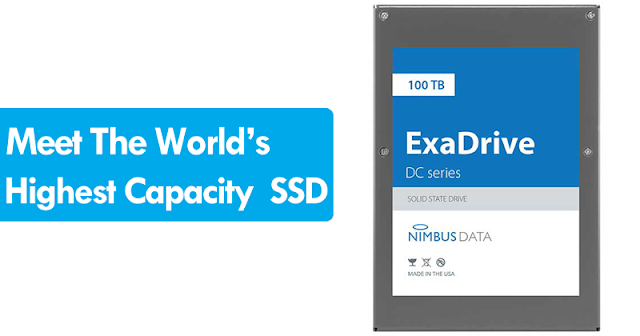 Today, Nimbus Data has announced an SSD of 100 TB, which represents a new storage record. The specific model is the Nimbus Data ExaDrive DC100, which is already starting to reach customers of the company in the form of samples. Its availability is also very close, as the company has said that it will start to be available in the market. To achieve this capacity, the company has used NAND 3D MLC memories manufactured by SK Hynix (probably 64 layers, although they have not confirmed this), as well as being a 3.5-inch unit. This capacity allows to store up to 20,000 HD movies, and has sequential read and write speeds of 500 MB/s when using SATA interface, as well as 100,000 IOPS. In addition to tripling in capacity to the highest available option currently, its energy expenditure is much lower; in particular, it is 85% more energy efficient per terabyte. The unit consumes 10 watts at rest and 14 watts in operation, something similar to what a high-performance hard drive consumes, and about 5 times more than what an SSD consumes than we can have on our PC. The latter is very important for potential buyers, including data centres. According to the company, in 2017, 40 million 3.5-inch hard drives were sold, totalling 250 million TB. Looking ahead to 2021, 10% of the new storage that is sold will make a transition to SSD with NAND Flash memories, being a potential market to conquer with this new SSD. In addition to the 100 TB unit, the company will also market a 50 TB version. Its warranty is 5 years, with a guaranteed durability of at least 2.5 million hours. Its price will not be cheap, and although the company has not announced what it will be, it is easy to estimate that it will not fall below $25,000. Over 5 years, its price is 42% lower than other enterprises SSDs. It is surprising that the company has announced that this unit will be available by this year only, of course, 2018, since the South Korean giant Samsung had stated that until the year 2020 we would not have SSD units of 100 TB. Nimbus also sells its hard drives through Viking or Smart, so we will surely see other units of this capacity being announced soon. 0 Response to "Nimbus Just Launched World’s Highest-Capacity SSD"